Menorca is the second-largest of the Balearic islands, and is both smaller and quieter than its neighbour Mallorca. Situated just 34 km / 21 miles from Mallorca, the island of Menorca has many family-friendly resorts and surprisingly almost as many beaches as both Mallorca and Ibiza combined. Peaceful holiday resorts line the south coast of Menorca and sleepy fishing villages are dotted along the rockier northern shore. Menorca has managed to escape most of the effect of package holidays, and the island's small towns and villages offer a fairly quiet and relaxing holiday, even during the peak season, with many wonderful attractions awaiting visitors. 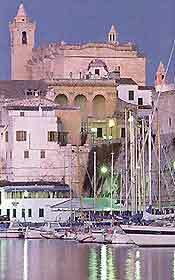 Mao (Mahon) is the walled capital on is situated at the end of an enormous natural harbour, on the eastern side of Menorca. Tourism in Mao is very much centred around the Placa de s'Esplanada and major narrow, winding streets stand alongside this square. Head to the Carrer de sa Rovellada de Dalt for Mao's main tourist information centre, and to the secondary branch on the Moll de Llevant. Largely protected from development, Menorca is a real haven for nature-lovers. 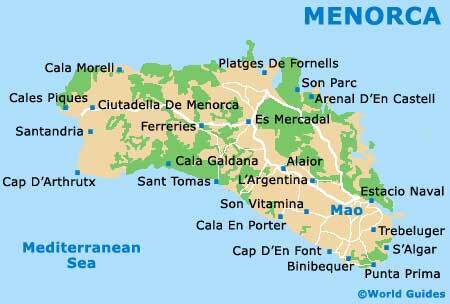 Menorca is a very green island, with pinewoods and many fields for the island's 25,000 grazing cattle. Cycling tracks criss-cross the meadows and scrublands, offering some spectacular views of the island and the seafront. The north coast of Menorca is rocky and rough, whilst in contrast, the south coast is full of secluded coves, with fine, golden sand, sheltered by cliffs. Apart from Mao, Ciutadella is one of the oldest and largest towns in Menorca and this ancient capital lies at the opposite end of the island. Mao remains a particularly busy port and has many impressive architectural features, whilst Ciutadella is a more graceful town, full of winding streets and old buildings, including several characterful churches. Menorca tourist attractions. In Mao, the Placa d'Espanya is a good point of reference and is close to the Mercat Claustre del Carme, an unusual shopping centre converted from former church cloisters. 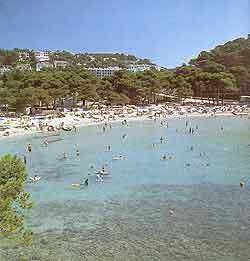 Beach-goers will find that the closest beaches to Mao include both the Platja de Punta Prima (south) and Es Grau (north), being easily reached by regular buses.